In 1995 during a visit to Israel, I forgot to pick up my return plane ticket back to New York. Being an informal country, the travel agent took the ticket home with her to Pisgat Ze'ev, a relatively new Israeli settlement built in the West Bank as part of the ever growing "Greater Jerusalem,” a place I had never been. Following her instructions, I set out from central Jerusalem to the northern outskirts, passing through two well established, prosperous settlements, Ramot Eshkol and The French Hill, dominated by grey and white concrete edifices, built twenty years earlier. I thought about all the people I knew in these settlements, completely unaware of the political complexities of the land they were living on. Lost in my reveries, I drove into Pisgat Ze’ev and soon realized I was completely lost. I stopped and asked for directions. The answer went something like this: "Turn right on Patrol Street, take a left on Air Force Street and you'll come to the General Bar Lev Junction. Make a right onto Armored Corps and you’ll hit the Jerusalem Patrol Street. From there you want to find the Jerusalem Tank Platoon…" and so it went. I drove around, forgetting I had a ticket to pick up. While all Israeli towns and villages have some streets associated with the military, I realized that here, all the streets had names derived from the Israel Defense Forces’ (IDF) current and past history. Pisgat Ze’ev had been built on lands confiscated from the Arab village of Beit Hanina, conquered in 1967 during the Six Day War. Today, most of these villagers still live nearby, in view of their old land, under occupation. Low and middle income Israeli families have been and continue to be, lured to the occupied territories by monetary incentives, low real estate prices, large apartments and spectacular views. Over the years, the inhabitants of Pisgat Ze’ev (not unlike the rest of the population), have constructed their identities, consciously and unconsciously, according to military lore. I contemplated the multitude of levels in which the military had penetrated into the civilian psyche. On some of the doors, I noticed people had put the name of the street, and right above it, their own family name, i.e., The Steinbergs, Golani Commando, 17A. I tried to imagine what it would feel like getting mail with the name of an elite army unit attached to my name on the envelope. During the following two years, I made several trips to the area to visually document the layout and design of the settlement and interview the Israeli families who lived there. It soon became clear that they had internalized the hierarchy that pervades the Israeli military. According to these civilians, those who live on Air Force Street or Commandos Street (two famous Israeli elite units admired and valorized by the Israeli public), are perceived as superior to those who live on Armored Corps Street (a unit perceived as comprised of inferior soldiers). 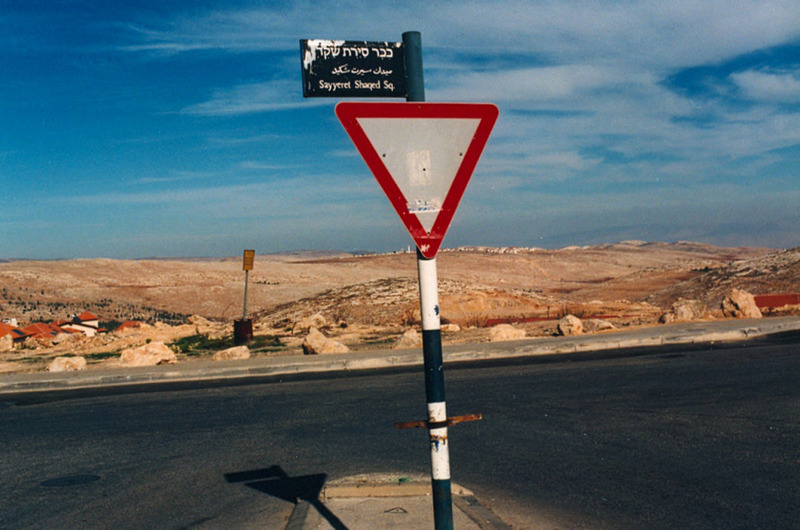 The project was exhibited at the Ami Steinitz Gallery in 1997, titled after a famous Israeli pop song, I Love a Guy in the Carob Commando (Yesh Li Ahuv B'Sayyeret Haruv). A second project was exhibited a year later at the Tel Aviv Museum of Art titled, Beit Hanina/Pisgat Ze'ev. I struck out the Palestinian name in order to illustrate the village’s actual erasure. The exhibitions consisted of photographs as well as actual street signs on small walls arranged in the form of a grave monument (in Israeli Jewish cemeteries, a rectangular monument of stone is built over each grave).